It all starts dreadfully, with ten to fifteen minutes of the most overwhelming and full-on story-telling. Filling the heads of the audience with so much information at the start really isn't clever and reminded me greatly of the comment that Little Sally says at the start of Urinetown about "too much exposition". It is all brilliantly presented by the cast, but is not the way to start a play that is meant to be for all the family. It thankfully calms down a little, but still remains reliant on performance and brilliant set pieces to make it work at all. One of those performances that pretty much saves the show is Greg Haiste's Black Stache, it is not an exaggeration that this performance, akin to Rik Mayall, is perhaps one of the best I have seen this year and this show could be close to nothing without him and his repartee with Smee (the brilliant Dan Starkey). Also quite brilliant (and a pleasure to see on the Royal stage again) is Evelyn Hoskins as Molly. A really great playful, but equally dominating performance, reigning over the men of the piece, and she is clearly always "better than boys". The role of Molly highlights another enormous gripe with this show, how male dominated it is. Evelyn of the cast of twelve, is the only female and in this age this is not only an outrage but totally unnecessary. Sure there is great comedy value from having Michael Matus play Mrs Bumbrake, but all that smacks at outrageous sexism that at no point they felt more ladies could take up the other male roles. It is sad that such a modern show as this still feels that it can get away with things like this. I am afraid theatre at times, like many modern areas needs to grow-up. While I am still being negative, I am not sure where and why the decision to include modern references was decided. While this is very clearly a late nineteenth century setting, including a famous explorer reference, the script decides that we need references to J.K. Rowling, Michael Jackson and Starbucks of all things. Hearing them alongside references to Queen Victoria and the British Empire is ridiculous. They are stunningly inappropriate inserts providing nothing other that perhaps a vague titter, but more commonly perhaps a shake of the head as to their pointlessness. However for all the negatives, there is one scene late in the second half with Black Stash and a trunk that perhaps could happily go down as one of the very best comedic scenes you are likely to see at the theatre. It goes a very long way to make you want to love the show as it truly is brilliantly funny moment. However by this point, you have waded through so much, it is most certainly too little too late to save this story from sinking to the very depths. So yes, this is at times stunning theatre because of an exceptional cast and skilled production and directorship from Luke Sheppard. However when the material is as hit and miss as this sadly is, it leaves a huge lingering disappointment in the heart. Regular theatre goers and lovers of the craft of theatre itself will gain from the production, less regular ones however are I fear going to be turned off the whole situation by the heavy handedness of the telling. Not a crushing disappointment, but sadly this story really rarely lives up to the story it proceeds. Performance reviewed: Tuesday 6th December, 2016 (matinee) at the Royal & Derngate (Royal), Northampton. 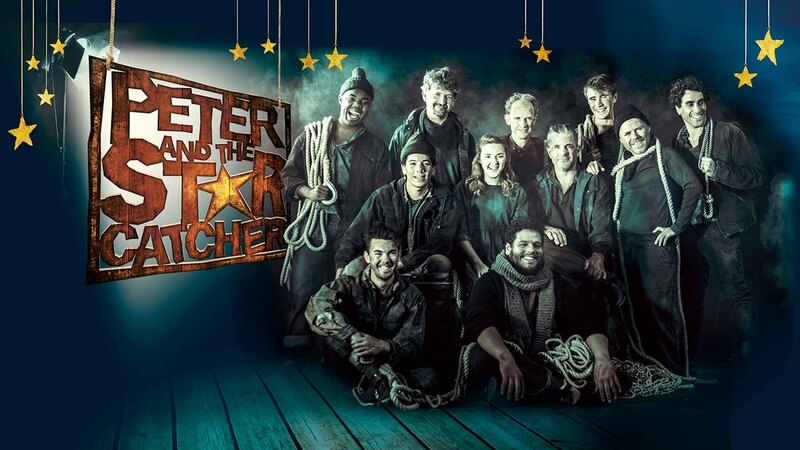 Peter And The Starcatcher runs at the Royal & Derngate until Saturday 31st December, 2016.